Bright and Big-Hearted students are eager to contribute to your community projects as Impact Interns! Here is why you should let them…. University students are great at challenging ideas and questioning traditional processes. The majority of university students are from a generation that is comfortable with change and adapt quite easily. They might just be the motivation you need to ditch an old process that isn’t quite working right now. For community organisations facing an ageing volunteer base, you can get skilled help on under-resourced projects and connect with the next generation of ideas, technology and people. Interns know things that you might not know and can bring a fresh perspective to the drawing board. Interns are great at working on tasks that have been neglected by employees because there just isn’t enough time. They can help relieve your staff members of all those extra jobs and give those jobs the attention that they really deserve. Milaana believes in giving interns real and meaningful tasks that will help your organisation to accomplish something as well as helping the intern to achieve key learning outcomes. Interns also have a great willingness to explore and experiment. They might be able to bring something fresh and unique to the task that makes it really stand out! 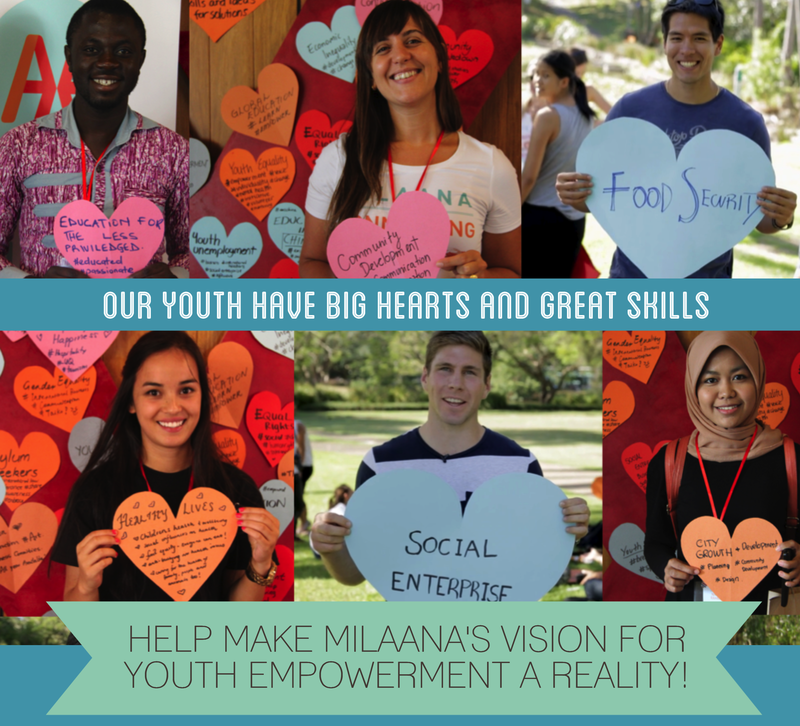 If you are here working with Milaana then we already know you are passionate about giving back to your community! 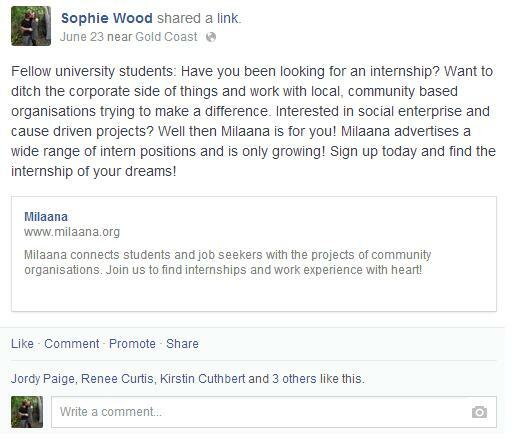 Hiring an intern is an extra contribution to the community that sustains your organisation. By hiring an intern an organisation is helping to benefit students learning and career development as well as promoting social enterprise. Your organisation might just be the one to inspire another person to make a change. Remember, be the change you wish to see in the world! An intern program is the perfect situation to test-drive a potential employee. You will get the chance to preview their skills, knowledge and work ethic and see how well they fit into your organisational culture. Even better, if you find an intern that you would like to hire then they are already partially trained and have a prior understanding of your organisation. Research has shown that Generation Y are part of a sharing culture. While other generations are more likely to give money to charity, Generation Y values the ability to share their actions rather than simply donate. For example, #freeourgirls. This is why hiring interns from Generation Y is a great chance to gain brand ambassadors. If an intern loves their work, then chances are they will share their love on social media. This increases brand awareness for your organisation without the need for marketing or promotion. There are COUNTLESS reasons to engage with this next generation of bright and big-hearted students, but, you need to be able to ensure it is a valuable and engaging experience for them in order to reap the benefits. Taking on an Impact Intern is a great opportunity but also a big responsibility for an organisation and something that shouldn’t be taken lightly. Interns need guidance, monitoring and a lot of support. They are similar to a child, minus the part where you need to feed and bathe them (hopefully). But in all seriousness, having an intern can mean serious work with the opportunity for incredible benefits! There are most definitely circumstances when hiring an intern is not the most appropriate action. Hiring an intern is NOT about needing free labour. An internship should be an engaging and valuable learning experience for a student and not a free labour opportunity for an organisation. By rule of thumb (aka legally), the intern should always gain the most benefit from the relationship. Make sure that your intern is receiving proper tasks with thoughtful learning objectives that relate to their degree. This is why we place so much focus on scoping out an engaging project for them to work on. An intern isn’t there to do all the mundane office jobs that no one wanted to do and they are never a replacement for a paid worker. If this is your mindset, you are actually doing your organisation a huge disservice. Todays students are EXTREMELY capable and motivated so your organisation is really missing out if you restrict them in their position. 2. Are you too busy to provide mentoring? Interns need training, mentoring and supervision and if you don’t have the time to provide this to them then it is probably best that you don’t commit yourself to an intern just yet. Once again, an intern isn’t just there to relieve work load. 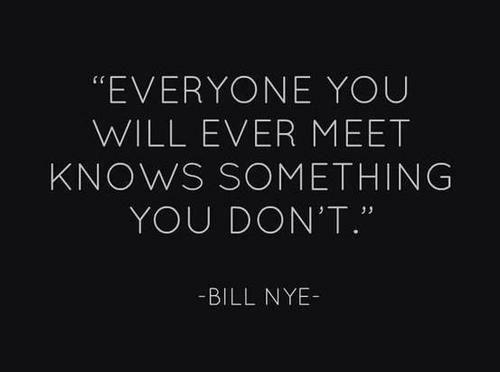 They are there to expand on their knowledge and learn something new. Unless you are highly dedicated in supporting their development then the relationship will not be beneficial for either party. 3. Do you have clear goals for the intern? Interns are looking for purpose when applying for an internship and this means providing clear goals and objectives. An Impact Placement should leave an intern feeling inspired, passionate and having learnt something new. If you cannot provide a clear direction for the intern, then they will come out of the program feeling lost, confused and likely uninspired by your organisation. Help to inspire a student by providing clear direction and learning objectives that feed into the overall vision of the organisation. Milaana is dedicated to making the organisation/intern relationship as beneficial as possible and a huge part of this process will be providing useful resources to both parties. What would you like to know next? Please head to www.milaana.org for more information on joining the Milaana team as an organisation or student.